A Clueless remake? As if! The very idea of besmirching such a sacrosanct text will no doubt appal ageing xennials who grew up on Amy Heckerling’s teen movie classic, and perhaps understandably so. Sure, a new version may not damage the brilliance of the existing film in any way, but when faced with perfection, why try to update it? Apart from anything else, the original is a time capsule that dramatically underscores the mid-90s – and no more so than via its soundtrack. It may not have been the first movie to prop up its characters' trials and tribulations with cuts’n’covers from the alt rock catalogue – Brat Pack director John Hughes’ various adventures with Echo & The Bunnymen, The Smiths et al predate 'Clueless' by a good decade. But rather than deploying angsty anthems over socially awkward misfits, the songs collected here are strident, colourful and expensively produced, perfectly echoing the life of the film’s hero Cher Horowitz (Alicia Silverstone). The movie’s opening montage perfectly sets up our expectations of Cher from the outset – her life is glamorous, her fashion sense is always on point and this is her time. This meshes perfectly with The Muffs’ take on Kim Wilde classic ‘Kids in America’; partly because the chorus homes in on the movie’s general vibe of ‘this is where we’re at’, and partly because the everyday ennui of the verse lyric invites us to look out of our own dirty old windows and into the much more vivid lives of the film’s protagonists. And there you have it: how to set a scene, in two easy steps. It’s the inclusion of this song (along with Smoking Popes’ closing credits-tastic ‘Need You Around’ and Jill Sobule’s ‘Supermodel’) that provides a launchpad for a series of later teen movie soundtracks – most notably ’10 Things I Hate About You’ (1999), with its judicious use of Letters to Cleo, but also the underappreciated ‘Josie & The Pussycats’ (2001), which used shimmering mall-punk as the selling point of a sharp, funny satire on advertising and consumerism. That’s not to say it’s all fuzzboxes and pace, though. Luscious Jackson show up to provide some much-needed slink, while Counting Crows’ ‘The Ghost In You’ is the one truly tender ballad on the record. Admittedly Radiohead – still largely famous for ‘Creep’ and little more, at the time – also offer one of their sweetest acoustic numbers in the form of ‘Fake Plastic Trees’, although its inclusion in the film is admittedly greeted with Cher’s reaction of, “Yuck! The maudlin music of the university station!” See? They were easy to take the piss out of long before ‘A Moon Shaped Pool’. The Radiohead cut also introduces us to Paul Rudd’s handsome college boy Josh – interestingly, we do not truly begin to warm to (spoiler alert!) Cher’s future beau until he dad-dances to skacore veterans The Mighty Mighty Bosstones later in the movie. Goofy skanking as a means of sowing the seeds of romance? Hey, it works better than singing plaintively about a ‘cracked polystyrene man’, that’s for sure. For many, the soundtrack peaks with the inclusion of Coolio’s ‘Rollin’ With My Homies’ (arguably performed more entertainingly by Brittany Murphy’s Tai in the film itself) – as fine an example of the decade’s pop-centric hip-hop as you’re likely to find and a rare, welcome diversion from all the guitars on display. We Brits even get a pat on the head thanks to the Lightning Seeds’ then-inescapable ‘Change’ and the UK’s own airhead anthem, Supergrass’ ‘Alright’ (are there many songs more 90s than that? ), as though opening up the narrative to remind us all that the vacuous lifestyles on display in the movie aren’t limited to Beverley Hills. But of course, while lampooning the excesses of Generation X’s last batch of high school students is the film’s medium, it’s not its message. 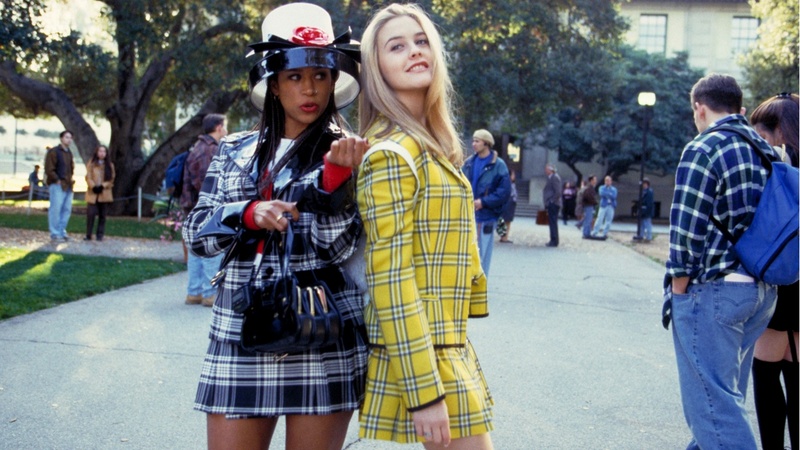 When Cher takes on the ‘clueless’ (hey, that’s the title!) Tai as a ‘project’, she recreates her protégé in her own image – and when faced with results, doesn’t like what she sees. It’s self-evidently a film about personal growth within social hierarchies, and when Cher (already kind-hearted, if misguided) finally begins to step outside of her own expectations of what people should be, she finally realises what she truly wants. That’s why the aforementioned ‘Need You Around’ works so well – a tenderly sincere lyric over a surging pop-punk melody feels positively triumphant in the wake of the self-actualisation of our hero.